GA, a mural by Mark Chu, on a building off Atlantic Avenue, near North Carolina Avenue, is one of the new art works in Atlantic City. Miss America terminates agreements with N.J., N.Y., and Fla. This one involves street murals on obscure retail corners, pop-up installations inside empty buildings, and an old artists' staple: really strong coffee. Loryn Lyn Simonsen, an artist and entrepreneur from Pleasantville, talks about new art in Atlantic City in front of "Find Your Way," a fully solvable maze mural by Bernie McCabe on a building off Tennessee Avenue owned by San Francisco developers. “I think it’s like any city,” said Simonsen, program manager for the Atlantic City Arts Foundation, which this month opened its sixth “Arteriors” exhibition in a vacant building, this time at 153 South New York Ave., open to the public on weekends through Dec. 16. "It has potential to be a lot of things," she said. "What we've seen in Atlantic City, it's been one thing for a long time." Simonsen and others have scoured the city for possible wall space for murals, mostly painted during the twice-yearly “48 Blocks” art festivals; in this town, once you start looking, the possibilities are endless. "We Call it Home," a mural by Air Rat, on a building off Vermont Avenue in the shadow of the Ocean Resort Casino, depicting the home of Vera Coking, who famously fought off an attempt by then-casino-owner Donald Trump to take her home, is one of the new art works in Atlantic City. “We seek out available spaces and place an artist at that space,” Simonsen said. 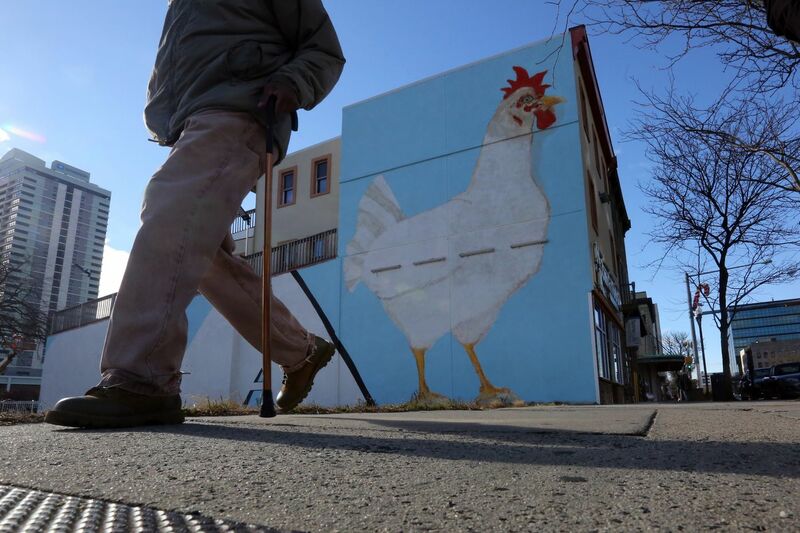 Murals have been placed on the sides of liquor stores, beauty salons, restaurants, and a lone house across from Ocean Resort Casino, the old Revel. The vantage points can be striking. “We Call It Home,” by the artist Air Rat, depicts the home owned by Vera Coking, who famously fought off then-casino-owner Donald Trump’s attempts to take her home to add to the Trump Plaza porte cochere, and squares off against the looming glass of Ocean Resort. The familiar Monopoly board on a building on Pacific Avenue is given a distinctive sprouting of flowers — and police caution tape — by Shari Tobias. "Pacific Garden," a mural by Shari Tobias, is on the side of a building off Pacific Avenue near Texas Avenue in Atlantic City. As for the coffee, that can be found at the city's first independent coffee shop, Hayday, where Simonsen is a co-owner, on Tennessee Avenue, a gritty stretch of beach block Simonsen and partners Evan Sanchez and Zenith Shah are trying to transform. Nearby is MADE, a new chocolate shop and bar, and the newly opened Tennessee Avenue Beer Hall. A block away on New York Avenue is a New Orleans-themed restaurant, Bourré, the first of a series of new projects by noted Asbury Park developer Pat Fasano, who has joined the Tennessee Avenue crowd and tagged the two blocks, along with St. James Avenue in between, the Orange Loop, after the old Monopoly board that people sometimes forget is set in Atlantic City. Also tucked into those streets is the old multi-turning side street of Westminster Avenue, known as Snake Alley, where the ghosts of A.C.'s once-vibrant gay bar scene surely stand ready for a revival. And may even still live in town. "Still I Rise," a mural by Loryn Lyn Simonsen, an artist and entrepreneur from Pleasantville, off LaClede and Ventnor Avenues, in Atlantic City. Simonsen was lured back to Atlantic City — she grew up in nearby Absecon — by the possibilities of a town where so many people visit, a town vivid in people’s imaginations, but a town lacking for things other places take for granted. Hayday is still the only independent coffee shop in Atlantic City. “The fact that we are right now is pretty wild,” Simonsen said. "Now, in 2018, to say, ‘Oh I left my job in New York and moved back home to open a coffee shop in a place that didn’t have one. But no, it’s not the middle of nowhere, it’s not suburbia or a desert, it’s a city. A city that people actively live in, work in, and visit.’ "
A mural by Mikey Whorror, on the corner of Drexel and New Jersey Avenues in Atlantic City. A tour of the city’s new murals, most painted during the citywide 48 Blocks festivals that brought artists like graffiti artist 4 Sakn, to Atlantic City’s many bare walls, reveals a range of mural art, most less literal or historical than is common in the Philly mural scene, some plays on A.C. themes, and an oversize chicken — GA — on the side of an Atlantic City Vietnamese restaurant called Com Ga Ninh Kieu. A full map of murals and other art projects undertaken during the foundation’s annual 48 Blocks arts festival can be found here, on the Atlantic City Arts Foundation website. The Arteriors art project off New York Avenue includes "Artie" by Ron Ross Cohen (left) and a mural by DJ Hexx. This time, government is following the artists, not dictating the art. The state Casino Reinvestment Development Authority is now seeking grants to pay for streetscape improvements on Tennessee Avenue, better lighting, some trash cans for the block. The businesses that showed up at the CRDA meeting included owners of the older Tennessee Avenue businesses, like Amina African Hair Braiding, in addition to the familiar new entrepreneurs. On Tennessee Avenue, a man walking by the “Find Your Way” mural by Bernie McCabe, a fully solvable maze of winding arrows and paths on the front of a building owned by San Francisco-based developers, says he’s not a big fan of the mural, and wonders about other issues like opioid addiction and the fallout from an FBI raid on the mayor’s home. Simonsen says art can find a footing in a town with all of Atlantic City's problems. "That's why we're doing what we're doing," she said. "The arts is a major part of it. It gets people talking and engaging, whether they like the art or not, It's bigger than that." "I'm not going to stand here and say all we need to do is paint murals and all will be fine," she said. Sydney Mount’s mural, off Dover and Ventnor Avenues, in Atlantic City. Still, Atlantic City is the kind of place where just looking at things a little differently, even just imagining the place as a city, not a seaside casino town, can feel liberating. That’s how Simonsen sees the lighthearted shark-themed mural on the side of the generically named A.C. Convenience Store on the corner of Dover and Ventnor Avenues. It’s a typical Atlantic City retail shop, in its own way as thriving as any trendy poke bowl place (A.C. finally has one) or coffee shop. Artist Christian Correa, 38, who grew up in Brigantine, returned to Atlantic City from Los Angeles two years ago. He’s working as a bartender at Bourré and as a recovery yoga instructor at the Leadership Studio. His piece inside Arteriors, done with Charles Barbin, is called "The Grotto,” a cardboard cave of stalactites and jeweled lighting, which he says illustrates the “cavernous” movement inspiring the new artists who’ve found community in Atlantic City. Christian Correa, who created "The Grotto," an art piece with Charles Barbin that’s inside the Arteriors art project off New York Avenue. He’s also painted two murals, one on the side of Bourré, the other on the side of the Little Water Distillery, which depicts “The Spirit of Atlantic City,” featuring Dizzy Gillespie, Atlantic City’s old Club Harlem band leader Chris Colombo, and the Greek god of the sea, Poseidon. "In that place of silence and darkness is where the good stuff happens," he says. "Everything coming out of Atlantic City was casinos closing, Hurricane Sandy. I knew there were good people down here doing good things. Those are equally as relevant as the people being punched in the park by a homeless man." "The Spirit of Atlantic City," a mural by Christian Correa and Leah Morgan, off Baltic Avenue.